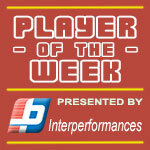 30-year old guard David Seagers (188-G-88) put on an extraordinary performance in the last round for Bima Perkasa and receives a Interperformances Player of the Week award for round 13. He had a double-double of 31 points and 11 rebounds, while his team crushed Pacific Caesar (#3, 4-6) with 17-point margin 92-75. Thanks to this victory Bima Perkasa moved-up to the 4th position in their group in Indonesian league. Bima Perkasa is a typical solid league team placed somewhere in the middle or a little bit lower in the standings. They need more victories to improve their 5-6 record. In the team's last game Seagers had a remarkable 54.5% from 2-point range. He just recently signed at Bima Perkasa, being already a very valuable addition to the team. David Seagers averages this season 20.8ppg, 9.3rpg and 4.8apg. Second best performed player last round was Dior Lowhorn (201-F-87) of league's second-best Satria Muda. He is American forward in his second season at Satria Muda. In the last game Lowhorn recorded impressive 28 points, 9 rebounds and 4 assists. Bad luck as Satria Muda was edged by slightly lower-ranked Siliwangi (#4, 4-7) 78-75. It was definitely game of the week between two contenders to the top position in White Group. Satria Muda still maintains its place in the top 2 of the standings, even despite this loss. His team is not often considered as one of the league's best with a mere 5-6 record. Lowhorn is well-known at Satria Muda and he already established his position as one of the team's leaders. He belongs to the best scorers in the league with 23.3ppg (#3). He also registered 10.0 boards per game. Third place about best performers goes to another Satria Muda's star - forward Jamarr Johnson (193-F-88). Johnson showcased his all-around game by recording 29 points, eleven rebounds (!!!) and five assists in the last round. Despite Johnson's great performance Satria Muda lost 75-78 to #4 ranked Siliwangi. But his team cannot count on just these two top stars as they also need help of the other teammates especially in such crucial game. The chances of Satria Muda ranking at the top of White Group, however are very questionable as they have already lost 6 games, recording just five victories. With bigger assistance of his teammates, Johnson could help Satria Muda to bring them higher in the standings. Johnson has a great season in Indonesia. After 10 games, he made it on the list of the league's leaders in rebounds with 11.0rpg (9th best). He also has 1.3bpg and FGP: 55.8%. 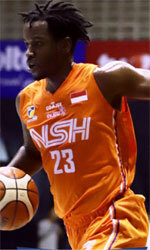 Jamarr Johnson has also Indonesian passport and can play in the league with a status of domestic player.